A federal court found him guilty in August of tax and banking fraud. 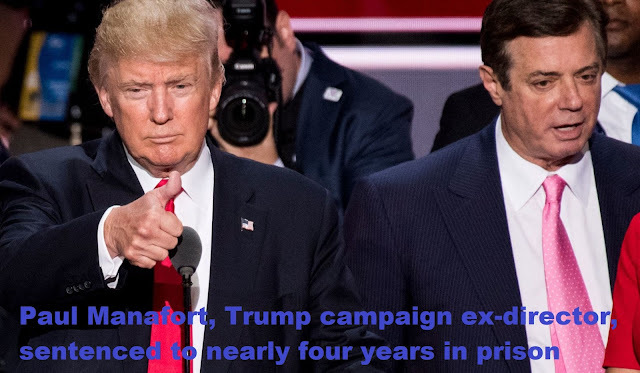 After the first trial of the investigation into Russian interference in the presidential election, former Donald Trump campaign director Paul Manafort was sentenced on Thursday night to nearly four years in prison. A federal court in Alexandria, a suburb of Washington, had found him guilty in August of tax and banking fraud. This forty-seven-month sentence is significantly lighter than the prosecutors' recommendations, which had suggested to the judge to punish him from nineteen to twenty-four years in prison. Jailed since June, Manafort is awaiting his sentence in a second illegal lobbying trial, this time in a Washington DC court. He, too, pleaded guilty. Lobbyist to dubious customers and luxurious lifestyle, Manafort, 69, led the Trump campaign from May to August 2016. The Republican candidate had recruited him to "presidential his campaign"; he must resign after the New York Times revelations about his involvement in a case of political corruption in Ukraine. Before being caught up by the investigation of Robert Mueller's special prosecutor on Russian interference in the presidential election. During his investigation, interested in Manafort, Mueller discovered financial malpractices prior to 2016, including the hiding in the US tax over 55 million dollars on about thirty accounts abroad. He also established that Paul Manafort had cheated banks on his finances to obtain loans. "What you have seen today confirms what we have been saying since the first day: there is absolutely no evidence of collusion between Paul Manafort and the Russian government," Kevin Downing told the court. the lobbyist's lawyer. The wrongdoings for which he was convicted were not related to his work for the Trump campaign, nor to suspicions of collusion with Moscow. Manafort has nonetheless become one of the key witnesses of the Special Prosecutor's investigation into Russiagate, notably because of his links with Konstantin Kilimnik, his associate in Ukraine considered by the US authorities as a Russian intelligence agent. The two men saw each other several times during the 2016 campaign. Manafort was questioned for more than 50 hours by Robert Mueller's teams.